Gullmarsstrand Hotel and Conference is a member of Svenska Möten/Swedish Meetings. Swedish Meetings are experts in meetings and helps companies and organizations to develop by taking advantage of the power of the personal meeting. This means that we have been accredited and carefully classified according to Svenska Möten’s unique classification system and the environmental accreditation Svanen. Accredited members offer the best meeting and conferencing possibilities. 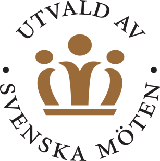 This seal is only available at facilities selected by Svenska Möten. Get time for other things! We know that there is a lot to think about and keep track of for larger meetings and events. With Svenska Möten’s registration system, you follow your participants throughout the event – from the invitation, via a separate web page with a smooth registration function, handling on site, payment solution to evaluation on site.